Jedediah Strutt, (1726 - 1797) or Jedidiah Strutt - as he spelt it - was a hosier and cotton spinner usually connected to Belper, Derbyshire, although also associated with Milford, Derby and Sth Normanton, Derbyshire. He was the son of William Strutt and Martha Statham, and was born at South Normanton, near Alfreton in Derbyshire on 25th July 1726. The Strutts were farmers and part of a small Presbyterian community with strong Nonconformist religious views. In 1740 at the age of fourteen, when he showed an interest in mechanics, Jedediah became an apprentice to Ralph Massey, a wheelwright in Findern. There he lodged with the Woolatt family. Findern also happened to be the base of the Nonconformist Findern Academy with Ebenezer Latham as its headmaster. Latham, as a friend of the Woolatt family, became a key influence on Strutt's early life, encouraging him to expand his learning. Jedediah later married Latham's servant, Elizabeth Woollat. After completing his apprenticeship, Strutt possibly went to Leicester to further his profession. But in 1754 he inherited a small stock of animals, and perhaps felt prosperous enough to ask Elizabeth Woolatt for her hand. They married in 1755 and moved to Blackwell where he had inherited a farm from one of his uncles (**) and, in addition developed a business carrying coal from Denby to Belper and Derby. The route he would have taken over the rolling hills and then largely uninhabited pastureland towards the only crossing-place over the river Derwent at Belper gave him his first inkling that this would be a perfect place to establish a home and business. The field paths he then used eventually became Field Row, Green Lane and Long Row as well as the Clusters. Here also he built his Chapel. William (1756–1830), who married Barbara Evans, daughter of Thomas Evans (by his second wife), and who invented the Belper stove. Their son was the Liberal politician Edward Strutt, 1st Baron Belper. Elizabeth (1758–1836), who married William Evans, son of Thomas Evans (by his first wife). Martha (1760–1783), who married Samuel Fox. George Benson (1761–1841), who married Catherine Radford, daughter of Anthony Radford of Holbrook. Joseph (1765–1844), who married Isabella Douglas, daughter of Archibold Douglas. Now more settled, Jedediah began to experiment once more with mechanical devices. His attention turned to the development of machinery to work in the thriving and expanding local knitting industry. As a small time hosier he started to gain an insight into the industry and the opportunities that existed. His brother-in-law, William Woolatt, who had served an apprenticeship in the industry provided further knowledge. In the 1750s several attempts were made by people working in the hosiery trade, to improve the stocking frame, a machine that had been invented by William Lee, a Nottinghamshire parson, in the 16th century. William Woolatt recognised that the problem in machine knitting was the inability to knit a ribbed fabric. At that time Woolat employed a Mr. Roper of Locko who had produced an idea for an attachment to the stocking frame to knit ribbed stockings. He had made one or two specimens which he showed to his friends, though he lacked the interest (and the capital) to develop his idea. Woolatt conferred with Strutt, who sold a horse and paid Roper £5 for his invention. With input from this invention Strutt and his brother-in-law developed the idea of an attachment that was placed in front of the stocking frame. This set of barbed hooks operated vertically among the horizontal needles of the frame, taking the loops from the latter and reversing them to make a rib stitch. Cotton was cheaper than silk and more comfortable than wool but demand had been far exceeding supply. The ability to make ribbed stockings quickly revolutionised the trade. Their machine became known as the Derby Rib machine, and the stockings it produced quickly became popular. 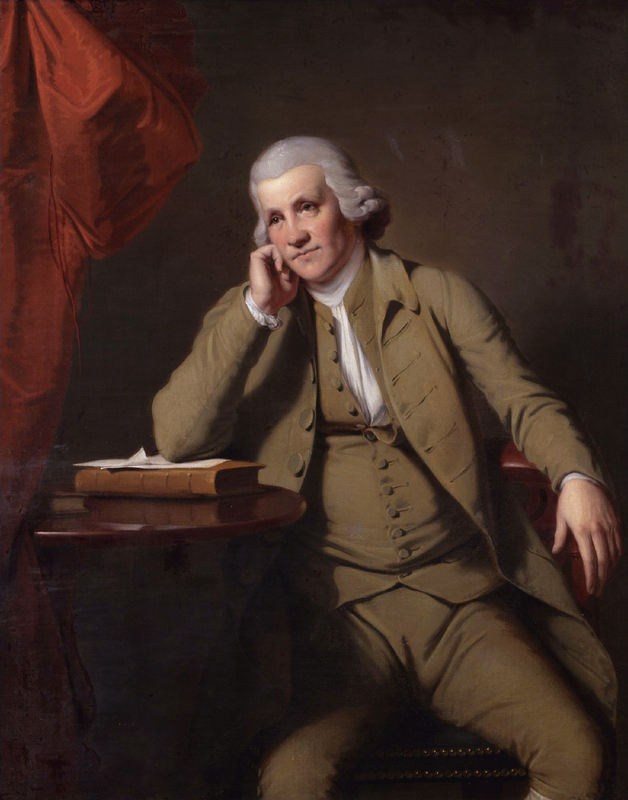 In early 1758 Strutt visited London with samples of the ribbed hose he had made using his invention. Strutt hoped to find businessman willing to back his stocking frame. This ended in failure, but later Strutt and Woollat formed a partnership with John Bloodworth and Thomas Stamford, two substantial hosiers from Derby. The four men obtained a viable patent for the invention and began producing the machine. However, in 1762 Bloodworth and Stamford, impatient with the slow sales of the stocking frame, left the partnership. Soon afterwards, Strutt found a new partner, Samuel Need, a hosier from Nottingham. Strutt's hosiery business began to grow rapidly. Strutt and Woolatt's new arrangement with Samuel Need as the third partner and financial backer meant that the business could prosper and expand. Strutt later founded a silk mill in Derby to supply local hosiers with quality yarn. The firm was known as Need, Strutt & Woollatt. The patent expired in 1773, though the partnership continued until 1781, when Need died. In 1768 another cotton-spinner, Richard Arkwright, had arrived in Nottingham, and had set up his spinning frame there using horse-power to run the mill, but this was an unsatsfactory power source. He went to Ichabod Wright, a banker from Nottingham, in search of funds to expand his business. Wright introduced Arkwright to Jedediah Strutt and Samuel Need who were impressed with Arkwright and agreed to form a partnership. 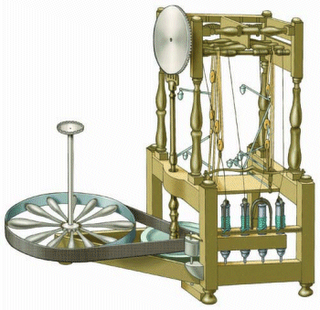 When the flying shuttle and the spinning jenny were first integrated into the textile industry, they were operated by hand. But the water frame used water from rapid streams to drive the flying shuttles and the spinning jennys, thus reducing the work that workers had to perform. The above is a drawing of Arkwright's water frame, the first textile machine designed to be powered by water. 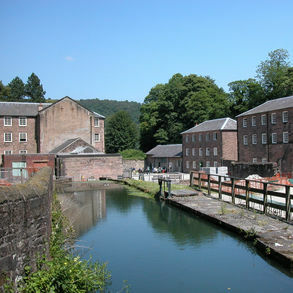 In 1771 Richard Arkwright, Samuel Need and Jedediah Strutt built the world's first water-powered cotton spinning mill next to the River Derwent at Cromford, Derbyshire, developing a form of power that was the catalyst for the industrial revolution. Advert that appeared in The Derby Mercury on 20th September, 1781. "Wanted at Cromford. Forging & Filing Smiths, Joiners and Carpenters, Framework-Knitters and Weavers with large families. Likewise children of all ages may have constant employment. Boys and young men may have trades taught them, which will enable them to maintain a family in a short time. " Jedediah's brother-in-law, William Woollat, was left to run the business in Derby. His three sons, William, George and Joseph, went on to be senior managers in the company. The Mill at Cromford (just south of Matlock Bath) is recognised as an internationally important site of the Industrial Revolution. It was the world's first successful cotton spinning mill that was based on water power. Arkwright became known as the 'Father of the factory system' and built the village of Cromford in order to house the workforce of his mill. His own mansion, Rock House, had a window that directly overlooked Cromford Mill, which kept the workers on their toes! The Derby Mercury (14th November, 1777) John Jefferies, a gunsmith of Cromford, has been committed to the House of Correction at Derby for one month; and to be kept to hard labour. John Jefferies was charged by Mr. Arkwright, Cotton Merchant, with having absented himself from his master's business without leave (being a hired servant). The mill was enlarged in 1776 and by 1790 the main buildings had been completed. All but two of these have survived to the present day. The Derby Mercury (22nd October, 1779) There is some fear of the mob coming to destroy the works at Cromford, but they are well prepared to receive them should they come here. All the gentlemen in this neighbourhood being determined to defend the works, which have been of such utility to this country. 5,000 or 6,000 men can be at any time assembled in less than an hour by signals agreed upon, who are determined to defend to the very last extremity, the works, by which many hundreds of their wives and children get a decent and comfortable livelihood. The site was eventually bought by the Arkwright Society who have made a fine job of renovating the mill. During the renovations, many of the water courses from the 1776 mill have been rediscovered. It now houses a visitor centre, several shops, educational facilities and a great tea room. By 1783 Arkwight was rich enough to build a huge new mill, Masson Mill, in Matlock Bath. (See the Arkwright pages for more information) But he and Strutt parted ways. When Samuel Need died on 14th April, 1781. Strutt and Arkwright decided to dissolve their partnership. Strutt was disturbed by Arkwright's plans to build mills in Manchester, Winkworth, Matlock Bath and Bakewell. Strutt believed that Richard Arkwright was expanding too fast and without the support of Need, his long-time partner, he was unwilling to take the risk of further investments. Following the death of Elizabeth in 1774, Strutt had married an Anne Daniels - a Belper widow - in 1781. Her maiden name was Ann Cantrell, the widow of George Daniels of Belper. There were no children from this marriage. His family disapproved of the new marriage and perhaps this also added to the desire for a change of plan. Strutt built Milford House in Milford and lived there until 1795, when he bought Exeter House in Derby with his second wife. Jedediah Strutt had land in Belper provided for him by William Slater, and his mills and housing transformed Belper and brought prosperity to the town. In 1776 and began building his first mill in Belper, which at that time was a hamlet and the main industry was nail-making. However, Belper already had an established knitting industry prior to Strutt's arrival. In 1781 he bought the old forge at Makeney by Milford Bridge from Walter Mather. 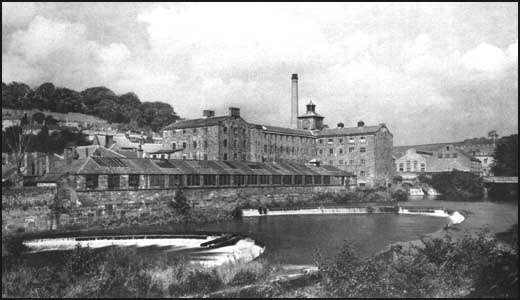 As well as Milford Mill, in time there would be numerous Strutt mills at Belper which would grow to a population of 10,000 by the mid-nineteenth century and be the second largest town in the county. The first mill, South Mill, was completed by 1776. In 1786 he built the North Mill, and across the road joined by a bridge, the West Mill. The stone gangway over the road - built around 1795 - also provided a defensive role, for along its length are gun embrasures which protected the West Mill counting house. North Mill was destroyed by fire on 12 January 1803. Its replacement was built in 1804 on the earlier mill's foundations by Jedediah's eldest son William Strutt. The new mill was much admired at the time as the most beautiful and technologically advanced building of the era, mainly due to its fire proof structure, the warm air central heating and the breast shot water wheel. It is one of the oldest surviving example of an industrialised iron framed 'fire-proof' building and is now recognised as one of the most important industrial buildings in the World, and as such, is a central point in the Derwent Valley Mills World Heritage Site. Other mills were added: the Round Mill, which took 10 years to build, from 1803 to 1813, and commenced working in 1816. To these eventually were added East Mill, an imposing 20th century brick building. Built In 1912, it is a massive red brick, 7 storey building, which dominates the town. It closed as a mill in the late 20th century and now houses a number of small industrial units, but still remains largely empty. 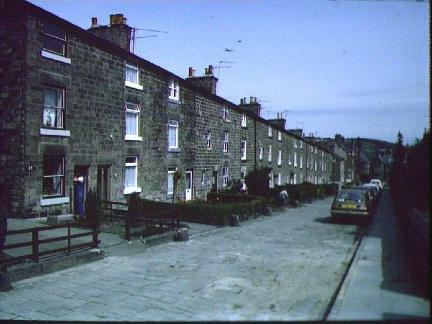 Both in Milford and Belper Strutt built long rows of substantial workers' houses. A man with a strong religious ethic, he believed in being a good employer and a humanitarian. In 1788 he built a Unitarian Chapel to serve the local community and provide a Sunday School for the town's children. Like other Non-Conformists, Strutt believed that wealth brought responsibility. Several observers passed favourable comments about the quality of the houses that he built in Belper and Milford. 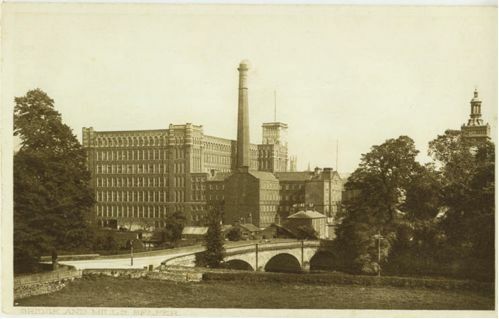 When William Gaskell visited Strutt's Belper village he wrote that it was a shame that there were not more factories owned by "men of enlarged benevolence and active philanthropy." Like all factory owners at the time, Strutt employed children. But in his case the children and all the workers were well cared-for. In 1774 Strutt told a committee of the House of Commons that he employed children from the age of seven but preferred them to be at over ten. Strutt criticised those employers who took children as soon as they "able to crawl". James Farington, diary entry (22nd August, 1801) In the evening I walked to Cromford, and saw the children coming from their work out of one of Mr. Arkwright's factories. These children had been at work from 6 to 7 o'clock this morning and it is now 7 in the evening. Buried outside the Chapel on the West Side. A few months before his death, Jedediah Strutt wrote his own epitaph. Here rests in peace Jedediah Strutt who, without fortune, family or friends raised to himself a fortune, family, and name in the world. Without much genius enjoyed the more substantial blessing of a sound understanding. He led a life of honesty and virtue and not knowing what would befall him after death, he died resigned in full confidence that if there be a future state of retribution it would be to reward the virtuous and the good. (**) NOTE: the identity of this uncle has been a mystery. However, from the information in Ince's pedigrees and other sources it's possible to suggest that this was his Uncle John, brother of his father William. This subject will be pursued in more depth on the pedigree pages.